Stewardship: The Parks Alliance and the Department of Public Works celebrated the 10th anniversary of the Street Parks Partnership, which has created over 125 parks, gardens and community gathering spaces from underutilized lots, median strips and hillsides. We also worked closely with the Recreation and Parks Department to transform Kezar Triangle from a muddy stretch of grass to a lovely meadow, and worked with a community group to build Dogpatch Playground--the only playground in this growing neighborhood--on a mini-park site owned by the SF Metropolitan Transit Authority. Philanthropy: In the second year of our Action Grant program, we awarded a total of $29,000 to support promising park projects, including Bloom Justice, Kids in Parks and Sutro Stewards. Our ninth annual Party for the Parks--themed "Wild in the City"-- grossed $413,000 to support Parks Alliance programs, the SF Recreation and Parks Department's Creeks to Peaks urban trail system and the Randall Museum. 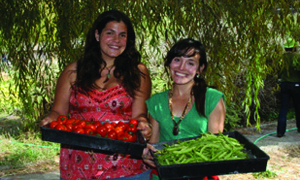 Policy: We conducted seven advocacy campaigns in 2014, including key support for three acquisitions using the Open Space Fund: the Schlage Lock Factory site in Visitacion Valley, Francisco Reservoir (soon to be Francisco Park) in Russian Hill, and 900 Innes in India Basin (a key link in the Blue Greenway). 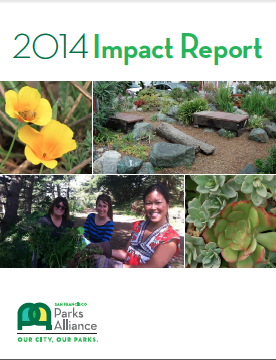 We also partnered with the Trust for Public Land on an economic impact study detailing the stunning amount our parks and open space contribute to San Francisco's economy -- almost $1 billion in annual economic benefits! To learn more about our work in 2014, download a copy of our 2014 Impact Report.